You might be good at some things. Like being passionate, charismatic or super-specialist, sort of. And bad or plain ignorant towards others. Yet, being good-at-doing-nothing is not something to aspire. Or is it? But I want to be good at doing nothing as well. Not that I’m already good at it, just saying. Idleness is not evil. It is fun, especially when done in moderation. In-fact, doing nothing is something I look forward to every once in awhile. At times, we do get stuck and all we need to do is dropping the resistance. Celebrating doing nothing! You get to touch yourself in ways you could not even think of while being mindlessly engaged in ticking off things in your to-do list. Your high-end engine needs to be regularly calibrated and oiled. Don’t burnout. Nothingness is a gift which breaks the stress cycle and makes you productive for the next batch of informational deluge. It is wonderful, to just get isolated from the noise. To not think of something. To flush the mind once and for all to welcome fresh thoughts in. To set aside some time for yourself. To exist freely. To just be. Because doing nothing is so underrated! It is OK: You must be already half-baffled by the concept of deliberately doing nothing. Due to years of mental conditioning, it won’t come naturally. But keeping oneself busy is more of a fad. Be a part-time philosopher. Source of inspiration: You can’t create anything without nothingness. Most great artists have their moments of inspiration while dreaming and imagining; roaming around in a world of their own making. In silent moments only, you have a chance of creating a spark which can illuminate the world around you. We already have enough production-chain type people around. Take a stroll: Be passive once a while. Try to sink into oblivion. Absorb the distant sounds. Blend in nature. You may get to learn a lot once you step out with no clear purpose. Glance at the sky: Observe the movement of the stars and the moon at night. It is also a great method of practicing patience. Or better yet, spot a constellation. Savor the food: When you think of it, it has become more of a daily chore. When was the last time you were consciously eating? Discussions with others and even yourself can wait. Food is a lot more tasty when full mental bandwidth is involved. Relax your body: Blend in the surroundings. Pick a spot and wriggle in there comfortably. Get all the things you’ll need beforehand, and retire. Keeping the IMs and tablets/cellphones out of a 1-mile radius counts as an added effort! As you might have guessed it already, indulging in this sort of behavior is a luxury. 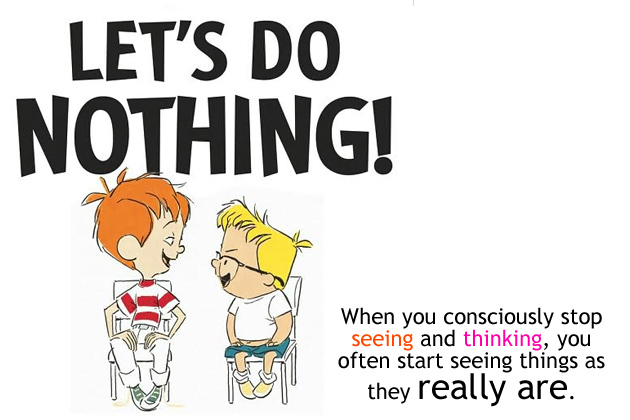 You need to meet the right balance between mindless activity and mindful inactivity. Being uncomfortable with your own self and solitude is not really a healthy sign, because you will be spending a major part of your life with yourself (er!). I certainly feel a little blue if I don’t do nothing for a really long time. The latest productivity hack can wait, of course. This entry was posted in To learn from life and tagged cog in a machine, drones, importance of solitude, mindless activity, planning and execution, productivity hacks, silent contemplation. Bookmark the permalink.